Professional butchers and others who work with knives for a living, depend on this glove for safety. If you're in the kitchen cutting and chopping, do so with confidence against minor accidental cuts and nicks. It's especially good to have handy if you have difficulties with healing from small cuts. 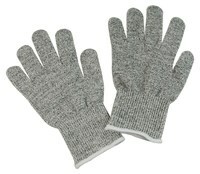 This comfortable glove is made of super tough stainless steel and cut-resistant nylon cord. Glove fits either hand and comes with a free cotton liner. So strong and durable, it meets OSHA standards. Machine washable. Technologically advanced manufacturing prevents wire breakage, even after machine washing Protects against most types of accidental cuts, but is not cut proof or point-puncture resistant. WARNING: Not for use with moving, serrated blades such as saws or meat slicers. Not for use with open flames. One glove. Size: Large. 1 Pair.